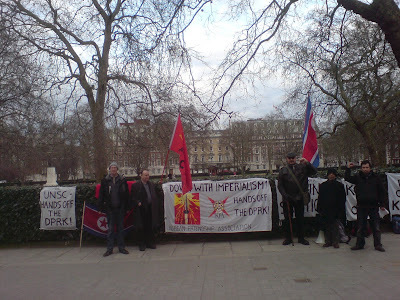 The Juche Idea Study Group of England and Association For the Study of Songun Politics UK issued a statement in connection with the ill boding and sinister moves of the US imperialists,south Korean fascist puppets and others to ovethrow the DPRK's socialist system by force as explained by the interview given by the KPA general staff on the 25th of March by KCNA. The stance expressed by the KPA general staff spokesman is a just and revolutionary one that defends the independence of the DPRK and the most advantageous Korean style socialism.The DPRK's socialist system is the cradle of life of the Korean people and the fount of independence and creativity.The US imperialists and south Korean puppets should not try to encroach or infringe upon this.It is only just that the KPA will mount nuclear strikes against the US imperialists and all those who try to destroy the DPRK. 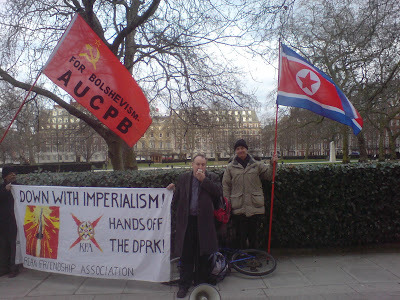 It is unthinkable and impossible that a so called "contingency " would occur in the DPRK and no one should lend an ear to such nonsense.The DPRK is the most stable and harmonious country in the world based on the Juche idea and the Songun idea.Such contingencies could only occur in a neo colonial dependency like south Korea where the people suffer poverty and double and triple exploitation or in the capitalist countries which are suffering socio-political explosions due to internal contradictions and austerity policies. The US imperialists and south Korean fascists puppets along with a big power are trying to create mechanisms to overthrow the DPRK and its Juche socialist system.Those who side with the US imperialists and south Korean puppets even passively commit an act of treachery to socialism and independence! British scientist Joseph Needham and lawyer Jack Gaster. findings and those of the international investigators. US must be made to pay dearly for this crime. the Korean War" is reproduced below. international investigation commissions and other material evidences. nations as the most barbarous, inhuman mass-destruction weapons. weapons from before the Korean war. of warfare, is quite within the bounds of possibility" (Hershel D.
bacteriological research centre in Frederick, the US mainland. retrieve itself from the ignominious defeat in the "strangulation"
Frederick, Maryland, which was the bacteriological research centre. As is widely known, the US army’s butcher boat No. while putting the germ weapons to the test against our POWs. in the camps on Koje and other islands. * UP, May 18, 1951.
gradual promo­tion from the experimental stage to regular operations. Atrocities of the US Aggressors in Korea, Pyongyang, pp. dropped in the night by B-29s over the northeast and northwest areas of Korea. Phyon-gan Province; Pakchon in North Phyongan Province; and others. Lawyers on US Crimes in Korea" dated March 31, 1952 (Ibid., p. 363). the US atrocity of germ warfare. extend its scope to most of the northern half of the Republic. First Wing of the US Marine Corps, to further escalate the germ warfare. Decem­ber 19, 1952" (Ibid., pp. 139-40). repeated contamination of them at an interval of ten days. * Documents on Atrocities of the US Aggressors in Korea, Pyongyang, p. 108.
dropping them on rivers and reservoirs, too. severely affected by the atrocious germ warfare of the US aggressors. January 10, 1953, mobilizing, on an average, 480 planes every day. warfare in the war history of the world. had "experience" of germ warfare. their latest achievements in that field. all requirements for research into bacteriology and experiments on it. of US imperialists in their germ warfare. imperialists only proved complete military defeat of the UN troops. awaits ahead of those who use them is the judgement of military defeat"
(Yoshitake Yojo, The United States Defeated, Tokyo, p. 98). *1. Documents on Atrocities of The US Aggressors in Korea, Pyongyang, p. 391. *2.
means of war as germ warfare which was banned by international law. Pyongyang, March 18 (KCNA) -- The U.S. "Reports on Human Rights Practices for 2009" have been ridiculed by the international community. The reports are nonsensical documents without any scientific accuracy as they grossly distorted human rights practices of many countries including the DPRK. No country of the world recognizes such nonsensical documents and pays heed to them. The U.S. claimed that it released the reports for "the protection of human rights." But it is a wanton violation of national sovereignty and a human rights abuse that the U.S. behaved as if it were "a human rights judge" in breach of the norm of international law calling for respect for sovereignty, though nobody entrusted such role to it. It is none other than the U.S. that should be condemned for human rights abuses more bitterly than any others. The U.S. is the worst country in the world where human existence and security are not guaranteed and elementary rights to social life are wantonly violated. In 2008, U.S. residents experienced 4.9 million violent crimes and therefore, a lot of Americans suffered from them, according to a report published by the U.S. Department of Justice in September 2009. In the U.S. it is the common life that individuals possess arms and kill each other. So, about 30,000 people die due to gun-related crimes and cases every year. Unemployment, poverty and the homeless are very serious problems in the U.S. where working people's economic, social and cultural rights cannot be guaranteed. Unemployment rate in the U.S. in 2009 was the highest in 26 years. And 39.8 million Americans were living in poverty by the end of 2008, an increase of 2.6 million over that in 2007. About 32,000 people commit suicides due to abject poverty in the U.S. each year, nearly double the cases of murder. Dwelling houses should be cradles providing stable life and happiness to people. However, in the U.S. they have become objects of speculation and many people are left homeless in the same day. This is the American society where the people live in agony and despair due to the uncontrollable catastrophic financial and economic crises. While vociferating about "freedom of speech" and "freedom of the press," the U.S. administration mercilessly abridges the freedom under various pretexts including that of "anti-terrorism." The U.S. continued faking up information for the "war on terrorism" including the Iraqi war. This goes to patently prove how hypocritical and nonsensical the U.S. touted "freedom of the press" is. After the U.S. invasion of Iraq in 2003, about one million civilians lost their lives in that country owing to the U.S. forces' military operations and violence, etc. The "Abu Ghraib" prison bears witness to the shuddering human rights abuses being perpetrated by the U.S. forces in the "war on terrorism". Americans' man-killing and human rights abuses are ceaselessly going on in Afghanistan and secret prisons in different parts of the world even today. The U.S. is the country with the worst human rights record and the world's arch human rights abuser. The U.S. interference in the internal affairs of other countries over human rights issues reminds one of a pupil trying to admonish his teacher. How can the society where exploitation of man by man is institutionalized establish a correct conception on human rights? Is it possible to guarantee the genuine rights and ideal of the popular masses to lead a free and happy life in such unpopular country? In the DPRK everything is made to serve the popular masses and the state enforces free health care and free compulsory education and provides them with de luxe houses free of charge. Is it conceivable in the U.S.? As everything that cannot be dreamed of and everything impossible in the U.S. are becoming realities in the socialist society of the DPRK, its people devote themselves to the work for the country's prosperity and the victory of socialism with high pride and great attachment to it, and find worth and happiness in doing so. No matter what rhetoric the U.S. may let loose, the army and people of the DPRK will confidently consolidate the Korean style socialist system centered on the popular masses that has grown stronger thanks to the Songun politics. 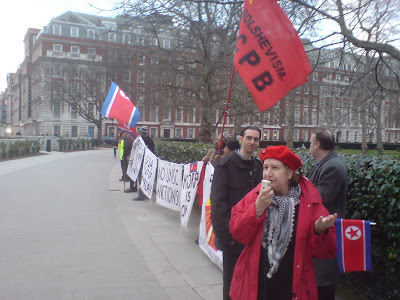 Members of the British Branch of the Korean Friendship Association headquartered in Spain, JISGE (Juche Idea Study Group of England) and For Bolshevism-AUCPB (All-Union Communist Party of Bolsheviks) staged a demonstration in front of the embassies of the United States and south Korea in London on March 15 in protest against the Key Resolve and Foal Eagle joint military exercises kicked off by the U.S. imperialists and south Korean warmongers. 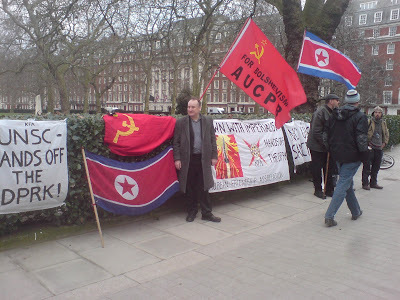 The demonstrators bitterly condemned the U.S. imperialists and the Lee Myung Bak group for staging the said saber rattling, rendering the situation on the Korean Peninsula extremely tense, flying flags of the DPRK and shouting slogans "Long live the DPRK!" and "Korea is one!" They declared that the south Korean "government" is a pro-U.S. puppet regime of an unpopular group of fascists from A to Z. They held that the socialist system in the DPRK is a socialist one under which the people have become masters of everything and everything in the society serves the people. south Korean puppet Embassy on Monday 15th. Live the DPRK " ,"Long Live Kim Jong Il" and "Victory to the KPA". 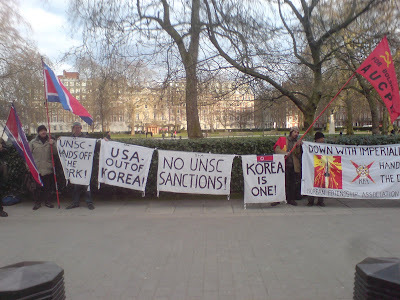 We started the picket of the US Embassy at 4-30pm.We had DPRK flags and the KFA banner plus placards with slogans "US out of Korea","No to UNSC Sanctions"
Embassy,again on the orders of the Yanks. Is One" as well "Victory to the DPRK"
The south Korean people's struggle to foil the madcap war moves to invade the DPRK by the US imperialists and the south Korean war maniacs, and to realize the lasting peace of the Korean Peninsula is vigorously continuing. On February 26, pro-peace and reunification movement organizations including the south Korean Solidarity for Realizing the June 15 South-North Joint Declaration held the 250th Friday rally against the US and war and for the withdrawal of the US troops in front of the US embassy in Seoul. Speakers there bitterly denounced the joint military exercises “Key Resolve” and “Foal Eagle”, drills for mounting a preemptive attack on the DPRK, which the US and south Korean war hawks planed to stage from March 8 to 18. They strongly urged the US to stop at once the military drills which will bring a nuclear war to the Korean Peninsula and positively come out to conclude a peace treaty with the DPRK. On March 3, the People for Peace and Reunification made public an article exposing the danger of the north-targeted joint military drills by the US imperialists and the south Korean war hawks. The article condemned the drills as provocative acts running counter to the aspiration of the compatriots for the reunification of the Korean Peninsula. It disclosed that the war drills of this year are to be staged in accordance with the war scenario for invading the DPRK more belligerent and reckless than the existing “OPlan 5027”, and the contents of the drills consist of such attack operations as removing WMD, street fighting and striking strongholds. The article asserted that if the bellicose forces conduct the north-targeted joint war drills in the end, it would only reveal their true color as ringleaders who block the establishment of peace mechanism on the Korean Peninsula. The US imperialists and the south Korean war maniacs should stop the north-targeted war drills which invoke the aggravation of tension and confrontation and exert sincere efforts to conclude a peace treaty and improve the inter-Korean relations. As you know well, The U.S. and south Korean authorities finally kicked off nuclear war exercises aimed at mounting a preemptive attack on the DPRK defying its repeated warning and the concern of the international community. This fact indicates that though the U.S. is talking in front about the dialogue and cooperation, there is no change in the U.S. administration’s ambition to suffocate the DPRK with the military power. The U.S. bellicose forces have recently decided to deliver a lot of ultra-modern sea patrol planes to south Korea within this year. The relevant measures are now being implemented. They claim that the deployment of such planes in south Korea is aimed at boosting what they call “combat capability,’ adding that this would render it possible to make long-range and precision strikes at the military targets of the DPRK. This is a revelation of a war scenario of those who are keen to ignite another Korean war at any cost and pot the whole of Korea under their control. Though this war the U.S. imperialists seek to boost the offensive capability of the U.S. forces present in south Korea and the south Korean forces and round off the preparations for a war. Timed to coincide with the deployment of the above-said ultra-modern sea patrol planes, the U.S. and the south Korean forces are staging madcap Key Resolve and Foal Eagle joint military exercises. The U.S. bellicose forces describe the exercises as “annual drills” and “defensive ones” but this is nothing but hypocritical rhetoric intended to cover up the offensive and aggressive nature of the exercises and their danger. The on-going exercises have rendered the situation on the Korean Peninsula so tense that it is beyond control and the military confrontation has gone into extremes. The situation made it clearer that the U.S. is not in a position to ensure peace and realize denuclearization on the peninsula and build confidence between the DPRK and the U.S. The U.S. is busy beefing up its forces and staging war exercises targeted at the dialogue partner while paying lip service to the “dialogue” with an ace to grind. This is nothing but crafty and brazenfaced double dealing tactics to achieve its criminal purpose with ease from a carrot-and-stick approach. The DPRK, to stop the tense situation on the Korean Peninsula , has strongly requested to the U.S. not to wage the joint military exercises with the south Korean authorities and has clearly warned about the responsibility of the result through the spokesman of the General Staff of KPA. But the U.S. finally kicked off nuclear war exercises defying the just request and warning of DPRK and this is the frank challenge and the peace destruction maneuvers. They launched such large-scale war exercises at a time when the DPRK government advanced an important proposal for building a lasting peace-keeping regime on the Korean Peninsula . This cannot be interpreted otherwise than a graver provocation. Ti is an act of chilling the efforts to realize the denuclearization of the peninsula. This fact indicates that though there was a regime change in the U.S. there is no change in the U.S. administration’s hostile policy towards the DPRK, a policy to bring down by force the ideology and system chosen by its-people. The U.S. is leaving no means untried to bring down the DPRK including military threat, economic sanctions and ideological and cultural poisoning. Military threat and economic sanctions cannot go with dialogue based on equality and they are incompatible with the process for denuclearization, in particular. Without a peace treaty it is impossible to defuse the military confrontation on the Korean Peninsula and it can never be denuclearized unless this confrontation is put to an end. The justice of the DPRK’s proposal for concluding a peace treaty has been proved once again. The DPRK is fully ready for dialogue and war. It will continue bolstering up its nuclear deterrent as long as the U.S. military threats and provocations go on. The Korean Committee for Solidarity with the World People expresses its firm belief that the peace-loving people of the world, by paying attention to the tense situation of the Korean Peninsula, will denounce the rash military war exercises of the U.S. and send their strong support and solidarity to the Korean people in their struggle for the peace and security of the Korean Peninsula. Plenipotentiary Representative of the Korean People's Army at Panmunjom on Sunday said that large-scale US-South Korean joint military exercises, forced to suspend "the process of denuclearization of the Korean peninsula. North Korea "will continue to strengthen its nuclear deterrent force, aimed at self-defense", Xinhua news agency quoted a representative of the North Korean defense officials. In the published Korean Central News Agency statement, Sun said the DPRK that the DPRK will no longer considers itself bound by the Armistice Agreement in Korea and the relevant inter-Korean agreement on mutual non-aggression. It will use its power of self-defense in accordance with its decisions, including the nuclear deterrent force. In addition, during the US-South Korean joint military exercises, the DPRK would suspend all military dialogue with the United States and the Republic of Korea . Menacing U.S. imperialism has made remarkable efforts to ignite the flames of war on the Korean peninsula and to destroy the freedom-loving, independent and courageous people of the DPRK, successfully building their own prosperous socialist state. Our party fully agrees with the judgements of the General Staff of the KPA and the NDC of the DPRK on the culprits of an explosive situation, which has re-emerged on the Korean peninsula. We fully support the DPRK's steps taken to defendt the independence and sovereignty of their country. Americans probably have forgotten the lessons of the Great Fatherland Liberation War 1950-1953 and try again to embark on a dangerous adventure – to "test" the strength of the socialist system, the monolithic unity of the DPRK people around their political party leadership, which, unlike the former leadership of the CPSU - USSR, which surrendered the country and the people to the enemy, the close-knit unity with the heroic people will do everything to defend the honour, freedom and independence of the DPRK. An attempt by the U.S. to unleash a war against North Korea could trigger the beginning of a third world war and the inevitable downfall of civilization. The financial movers of the US are trying to save agonizing imperialism, via the outbreak of another world war, ignoring the fact that while no one can escape – there will be no winners! We call upon world public opinion, the working people of all countries to act decisively against another criminal adventure by the ruling elite of the U.S. and those governments that are allied with the United States who are acting against their own people. This, alas, includes the Government of Russia. Oppose Foal Eagle and Key Resolve war exercises ! The US imperialists and their south Korean puppets are holding the so called "Foal Eagle " and "Key Resolve " war exercises targetting the Democratic Peoples Republic of Korea(the socialist north) which involve 18,000 troops.Such exercises coming at a time of contuining tension on the Korean peninsula are not only a threat to the DPRK but also to world peace. This will be to protest agaist the holding of the exercises but also to demand the dissolution of the south Korean "Unification Ministry" and "National Intelligience Service"
It is with a sense of great concern that we, the friends of Korea, view the recent sinister delevopments on the Korean peninsula. The North Staffordshire regional committee of the Korean Friendship Assoication(UK) sees the staging of military manoeuvres codenamed "Key Resolve/Foal Eagle" in south Korea during the period of March 8th to March 18th 2010 by the United States and by the south Korean regime has being highly provocative and extremely dangerous.These exercises now underway are nothing but a simulation of the kind of regime change which was carried out by the brute armed force of US imperialism in Afghanistan & Iraq. The US is throwing into "Key Resolve/Foal Eagle" 10,000 troops and 8,000 reinforcements from the US mainland and from other theatres. During the manoeuvres the US military are replicating the use of short range nuclear weapons aganist the north and the US is practising the tactics of blockage aganist DPRK ports under the PSI scheme. Public opinion throughout the world got the impression that with a change of administration in the White House last year the United States would fundamentally amend its attitude towards the DPRK. Instead the Obama administration and the Lee Myong Bak regime are following the failed and obsolete policy of confrontation with the DPRK as evidenced in the "Key Resolve/Foal Eagle" game. The warlords of Washington and Seoul should be aware that pressure and threats will never work with Socialist Korea. Time and again the DPRK has called for the United States to sign a peace treaty, which would guarantee stability and tranquillity on the Korean peninsula and in northeast Asia. 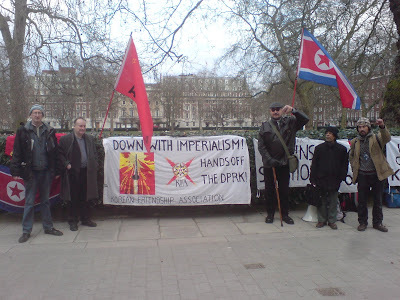 The British friends of Korea hope that the north and south of Korea can return to process of Peace and reunification began ten years under the patriotic banner of "By-Our-Nation-Itself". 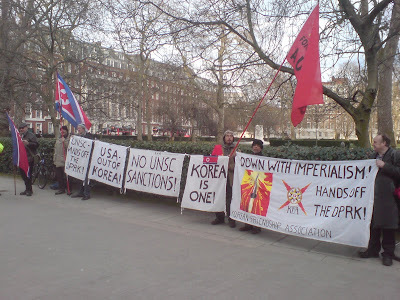 The North Staffordshire Regional Committee of the Korean Friendship Association (UK) calls upon all peace campaigners,anti-imperialists and democrats in Britain and in other countriesto put strong presurre on the United States and south Korea to immediately halt these aggressive war games at once. We in the North Staffordshire KFA desire to see direct negotiations between the Democratic Peoples Republic of Korea & the United States for a lasting peace. The dream of the Korean nation for reunification must be made a reality by the Korean people independently.We urge the British public to struggle for solidarity with the Korean people in their fight for reunification and the KFA(UK) demands that the British Government follows a positive course in opposing the current war games being held in south Korea. The US and south Korean warmongers planned to stage again the joint military exercises codenamed “Key Resolve” and “Foal Eagle” aimed at the invasion of north Korea from March 8 to 18 throughout south Korea despite the unanimous opposition of all the Korean people and the world peace-loving people desirous of a lasting peace and security of the Korean Peninsula and Korea’s reunification. Participating in these aggressive war drills are 10 000 US troops stationed in south Korea and 8 000-strong reinforcements from the US overseas military bases, totaling 18 000, and a huge number of the south Korean puppet army. As an undeniable evidence to the hostile policy toward the DPRK and the inter-Korean confrontational policy pursued by the US and the south Korean regime, the upcoming drills will drive the already aggravated inter-Korean relations to a catastrophe and further exacerbate the showdown and tension on the Korean Peninsula posing a sever threat to peace and security of not only the north East Asian region but also the rest of the world. As these drills are to be conducted at the time when the DPRK offered an important proposal to conclude a peace treaty for establishing a durable peace mechanism in the Korean Peninsula this year that marks the 60th year of breakout of the Korean war, and exerts sincere efforts to realize it and actively strives to improve the inter-Korean relations, their dangerousness and consequences are rendered more grave. The reality clearly shows that the US and south Korean war maniacs don’t want peace of the Korean Peninsula nor the improved inter-Korean relations, and what they pursue is only confrontation and war. 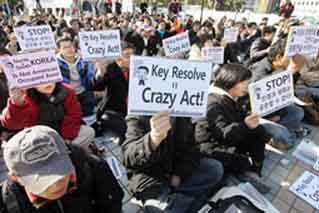 They should stop at once the provocative “Key Resolve” and “Foal Eagle” war drills and abandon the arms buildup, mindful of the catastrophic consequences to be entailed by their reckless war provocation moves. The US is well advised to daringly discard its hostile policy to stifle the DPRK and come out to the negotiating table to conclude a peace treaty aimed at replacing the cease-fire of the Korean Peninsula with a lasting peace mechanism. The south Korean war fanatics should not take part in the confrontational moves against the compatriots and aggressive war provocations in collusion with the foreign forces, but take a resolute measure to improve the inter-Korean relations in accordance with the trend of the times and the desire of the fellow countrymen. Now the south Korean people from different social segments denounce the projected war drills as overt provocation to all the compatriots and world peace-loving people desirous of peace, and never-to-be-pardoned challenge which would bring about a nuclear war to the Korean Peninsula , and vigorously wage the struggle against the US and war and for defending peace. We avail ourselves of this opportunity to express our expectation and belief that your organization which always pays deep attention to the peace of the Korean Peninsula and renders firm support to the reunification cause of the Korean people, would conduct solidarity actions in condemnation of the war moves to invade the DPRK by the US imperialist and south Korean warmongers. Those actions may include publishing denunciation statement and sending protest message to the White House and the south Korean presidential office, etc.